On 21 August 2015, a man opened fire on a Thalys train on its way from Amsterdam to Paris. Four people were injured, including the assailant. French, American, and British passengers confronted the attacker and subdued him when his rifle jammed. For their heroism they received France's highest decoration, the Legion of Honour. The assailant initially claimed to be only a robber, but later confessed that he had wanted to "kill Americans" to revenge bombings in Syria. 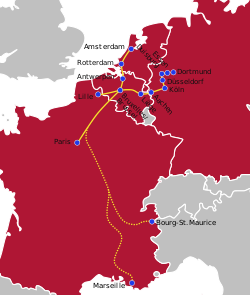 Thalys passenger train 9364 from Amsterdam to Paris crossed the Belgium border to France at approximately 17:45 CEST on 21 August 2015. A 25-year-old Moroccan man named Ayoub El Khazzani emerged from the lavatory room of car No. 12. He was shirtless and brandishing an AKM assault rifle. In addition to the rifle, for which he had nine magazines and a total of 270 rounds of ammunition, he was carrying a concealed Luger pistol, a utility knife, and a bottle of petrol. As El Khazzani exited the lavatory, he encountered 28-year-old Frenchman "Damien A." On seeing the shirtless and heavily armed Moroccan, Damien attempted to restrain the gunman, but was overpowered and fell to the floor. Seated nearby, American-born Frenchman Mark Moogalian (age 51) saw the scuffle, got up, and in the ensuing struggle wrested the rifle from El Khazzani. As he turned to move his wife out of harm's way, El Khazzani pulled out a concealed 9mm Luger pistol and shot Moogalian in the neck. Seriously injured, Moogalian fell to the floor and remained still, playing dead. El Khazzani retrieved the rifle, walked to the passenger area and attempted to fire the weapon at the occupants of the car, but the weapon jammed. Sitting about 10 meters down the aisle from El Khazzani were three American friends, two of them off-duty members of the Armed Forces: 23-year-old Airman First Class Spencer Stone, 22-year-old Specialist Alek Skarlatos, and 23-year-old Anthony Sadler. Alarmed by the sound of the gunshot that injured Moogalian, and seeing the shirtless Moroccan with an assault rifle, Skarlatos cried out to his friends "Get him!" Stone, who did not know the weapon was jammed, moved first. He ran up the aisle, straight at the gun-wielding El Khazzani and put him into a chokehold. Attempting to free himself, El Khazzani repeatedly cut Stone in the hand, head, and neck with the utility knife; Stone's thumb was nearly severed. Skarlatos seized the jammed rifle off the floor and began "muzzle-thumping" El Khazzani about the head, while Stone continued his choke-hold. El Khazzani fell unconscious. In a video taken in the immediate aftermath, an American voice can be heard exclaiming, "Dude, I tried to shoot him." British passenger Chris Norman (age 62) and a French train driver helped to hold El Khazzani down, and they used Norman's T-shirt to tie his arms behind his back. Skarlatos then swept the other cars for more gunmen with the assault rifle and pistol in hand. He noted that the assault rifle was jammed and the pistol was missing a magazine and had no rounds in the chamber, neither gun was fire-ready. Stone, a military-trained medic, tried to stop the severe bleeding from Moogalian's gunshot wound by wrapping his shirt around the injury. This proved ineffective, so he stuck two fingers into the wound and pushed down on an artery, which stopped the bleeding. The train was carrying 554 passengers and was passing Oignies in the Pas-de-Calais department when the attack took place, and it was rerouted to the station of Arras. Moogalian was airlifted to the University Hospital in Lille, while Stone was later treated for thumb and eye injuries and other wounds. The remaining passengers were taken to Arras, where they were searched and identified before being allowed to proceed to Paris. Ayoub El Khazzani (born 3 September 1989, also spelled El-Khazzani and el-Qazzani) from Morocco was identified as the assailant by French and Spanish authorities; he had boarded the train in Brussels. He carried no identification but was identified by his fingerprints. He had resided in Aubervilliers, Seine-Saint-Denis, France, since 2014. He was originally from Tétouan in northern Morocco and moved to Spain in 2007, two years after his father had legalized his status there. He was an employee at the mobile phone operator firm Lycamobile for two months in early 2014 before leaving due to not having the right work papers. El Khazzani was known to French authorities and had been tagged with a fiche "S" (S file or security file), the highest warning level for French state security. He had been similarly profiled by Belgian, Spanish, and German authorities. He had reportedly lived in the Spanish cities of Madrid and Algeciras from 2007 to March 2014. During his time in Spain, he attracted the attention of authorities after making speeches defending jihad, attending a known radical mosque, and being involved in drug trafficking. He then moved to France, and the Spanish authorities informed the French of their suspicions. French Interior Minister Bernard Cazeneuve claimed that he moved to Belgium first in 2015. He had reportedly spent time between May and July in Syria before moving to France. El Khazzani initially told his lawyer that he was simply a homeless man who, while sleeping in a Brussels park, found a suitcase containing a rifle and pistol, and that he had no intention to massacre the passengers but planned to rob them so that he might eat. However, authorities said that his explanations became less plausible with each questioning and that he had eventually stopped talking to investigators. According to prosecutor François Molins, El Khazzani listened to a "YouTube audio file in which the individual exhorted his followers to raise arms and fight in the name of the prophet" and that his Internet browsing history showed "clear evidence of terrorist intent." Prosecutors discovered the files on his phone, which they say he listened to immediately prior to the attack. In December 2016, El Khazzani confessed to French courts that he was from Syria and had traveled to Europe for the express purpose of killing Americans in revenge for bombings in Syria. He told a French judge that "I'm a real jihadist, but we do not kill women and children. I am not a slaughterer. I am a noble fighter. I am a soldier." French newspaper La Voix du Nord said that the gunman in the Thalys attack may have had connections to groups targeted by the Belgian counter-terror operation, and authorities are currently[when?] investigating the link. One of the gunmen in the 2015 Île-de-France attacks, Amedy Coulibaly, had purchased automatic weapons and a rocket launcher from Belgian gangs, allegedly in a black market near Gare du Midi, the station where El Khazzani boarded. Preliminary charges were filed against El Khazzani on 25 August 2015 by the Paris prosecutor's office for attempted murder in connection with terrorism, possession of weapons in connection with terrorism, and participation in a terrorism conspiracy. He was remanded into custody. He was still in jail awaiting trial as of May 2018 and remains the only person charged in the case. Damien A., a 28-year-old French banker, the first passenger to tackle the gunman; he wished to remain anonymous. Mark Moogalian, a 51-year-old American-born Frenchman with dual nationality who teaches English at the Sorbonne. The second passenger to intervene, he momentarily wrestled the rifle away from the gunman. He sustained a non-fatal gunshot injury to the neck that required emergency surgery at Lille. Chris Norman, a 62-year-old British businessman living in France. He helped subdue the gunman. Anthony Sadler, a 23-year-old American student in his senior year at California State University, Sacramento, and a high school classmate of Stone and Skarlatos; he helped Stone and Skarlatos tackle the gunman. Alek Skarlatos, a 22-year-old American Oregon Army National Guard specialist, on leave after deployment in Afghanistan, former neighbor and classmate of Stone; he struck El Khazzani with the jammed assault rifle. Spencer Stone, a 23-year-old American airman first class in the Air Force who was on leave from the 65th Air Base Group; he sustained several cuts, a fractured finger, and an injury to his right eye, which were treated in a hospital near Lille and later at Ramstein Air Base in Germany. An off-duty French train driver who also helped subdue the gunman; his name has not been released. Norman, Sadler, Skarlatos, and Stone were made Knights of the Legion of Honour (Chevaliers de la Légion d'honneur) on 24 August by French President François Hollande. Moogalian was also made a Knight of the Legion of Honour on 13 September 2015, with Damien A. expected to be similarly honored at a later date. Norman, Sadler, and Skarlatos were also awarded the medal of the city of Arras. In the United States, Sadler was also awarded the Secretary of Defense Medal for Valor. Skarlatos was awarded the Soldier's Medal, the highest medal awarded to Army personnel for actions outside of combat, while Stone was awarded the Airman's Medal and the Purple Heart. He was also meritoriously promoted two grades on 1 November to Staff Sergeant. Stone and Sadler also received the Civic Medal 1st class from the Prime Minister of Belgium. Sadler, Skarlatos, and Stone were naturalized as French citizens in an honorary ceremony at the Alliance Française in Sacramento, California on January 31, 2019. France: The three Americans and Norman were hailed as "true heroes" by the mayor of Arras, Frédéric Leturque. French president François Hollande and Interior Minister Bernard Cazeneuve praised them for their bravery. United Kingdom: British Prime Minister David Cameron praised the "extraordinary courage" of those involved in taking down the attacker, including Briton Chris Norman. United States: The White House stated that "the President expressed his profound gratitude for the courage and quick thinking of several passengers, including U.S. service members, who selflessly subdued the attacker ... It is clear that their heroic actions may have prevented a far worse tragedy." U.S. President Barack Obama called the three Americans on 22 August to personally thank them for their bravery. General Philip M. Breedlove of the U.S. European Command in Stuttgart, Germany, said the three Americans' actions, "clearly illustrate the courage and commitment our young men and women have all the time, whether they are on duty or on leave." Koen Geens, the Belgian Minister of Justice called for increased collaboration within the EU on arms trafficking. Geens said "I do not believe that these weapons are of Belgian origin" and "there are far too many illegal Kalashnikovs and [military surplus] arriving in Belgium from Eastern Europe." He called for more effective arms control outside the Schengen zone, and flagged increased police powers against weapons traffickers. On 29 August, ministers from France, the UK, Germany, Italy, Spain, Belgium, Luxembourg, the Netherlands, and Switzerland met in Paris to discuss train security, including the possibility of using metal detectors for some international train passengers. In response to the attack, the Belgian government decided to increase patrols of Belgian police at international train stations and to increase baggage checks. Belgian Prime Minister Charles Michel called for urgent talks with France, Germany and the Netherlands on increasing security on cross-border trains. The European Commission said that the Schengen treaty is non-negotiable, and that increased security checks cannot include border checks. European Union officials are now considering introducing metal detectors and body scans at all train stations, along with an increase in CCTV cameras inside trains. Three different official investigations have been launched by governmental authorities, one in France, another in Spain, and the third in Belgium. In addition, Thalys International has launched their own internal investigation. On 21 August, the anti-terrorist section of the French public prosecutor's office in Paris took over the investigation based on "the arms used, the events that unfolded, and the context." In view of the gravity of the acts he was accused of, the suspect was placed in custody for a period which could be extended to 96 hours. According to the police, based on the modus operandi the attack resembled a terrorist attack. A Spanish police spokesman said that the suspect's parents' house in Algeciras had been searched. In the aftermath of the November 2015 attacks in Paris, it was reported that Abdelhamid Abaaoud was under investigation by French police as a possible link to the Thalys attack. On 14 February 2018, French police arrested a Moroccan citizen in Paris who was suspected of involvement in the attack. The man was travelling from his home in Spain to Belgium at the time of his arrest. A spokesman for the Belgian Federal Prosecutor's Office announced on 22 August that they had launched an investigation into the attempted attack. They consider that Belgium is involved due to the heavily armed perpetrator having boarded the train at Brussels-South railway station. At the initiative of the French National Railway's President, Guillaume Pepy, an internal investigation was launched by Thalys in order to shed light on the sequence of events during the attack. On 18 September, Thalys published an internal report about the assault. French actor Jean-Hugues Anglade, who was traveling in the last car before the rear engine, alleged that the train crew locked themselves in the engine car and did not come to the aid of passengers. He said they heard gunshots and screaming in the next car, after which several crew members rushed past them to the engine car, opened it with a key and locked themselves inside. He said the dozen passengers in his car banged on it and begged the crew to open it. He also said that when Sadler came into their car searching for blankets and a first aid kit for the wounded, Sadler also banged on the door of the engine car to no avail. Anglade's claims were denied by the Thalys corporation and he later acknowledged that the two crew members who locked themselves in the engine car with a handful of passengers were not Thalys employees but contractors from a catering company. He added, "The French conductor and the other Thalys employee present in the coach where the assault took place showed ... heroic behavior." Agnès Ogier, director-general of Thalys, defended the train employees, who she said "have fulfilled their duty" and were unaware the terrorist had been subdued. She also reported that a male employee took five or six passengers with him while seeking shelter. On 26 August, El Khazzani's lawyer, Me Mani Ayadi, criticised the treatment of his client during the latter's transfer to the courthouse, where a handcuffed El Khazzani was walked into the building blindfolded and barefoot. In response, a French official familiar with the case stated that the authorities followed standard security precautions, which dictate that suspects charged with terrorism and organized crime be blindfolded so they cannot later identify the officials escorting them. The official also said the accused refused to wear the shoes offered to him. On 1 September, the French public prosecutor's office issued a warning to television network i-Télé after its 25 August broadcast showing suspect El Khazzani arriving at the courthouse in handcuffs. It is illegal in France to publish images of people in handcuffs (prior to their conviction) without their consent, due to the presumption of innocence. i-Télé digitally blurred out El Khazzani's hands, but the prosecutor's office warned the network that this was insufficient, and criminal charges would be brought against it if this reoccurred. In 2018, the event was dramatised as the film The 15:17 to Paris, directed by Clint Eastwood and starring Anthony Sadler, Spencer Stone and Alek Skarlatos playing themselves. ^ The injured were Moogalian, Stone, El Khazzani, and Anglade, whose injury was indirectly related to the incident). Some early reports claimed that others were injured, including Norman and a train conductor, but these were not confirmed subsequently. ^ a b "Attentat dans un Thalys: Le scénario de l'attaque déjouée minute par minute [Attack in Thalys: The scenario of the foiled attack minute by minute]". 20 minutes (in French). 22 August 2015. Retrieved 23 August 2015. ^ a b c d "Suspect in France train shooting watched jihadi video prior to attack, French authorities say". Fox News Channel. 25 August 2015. Retrieved 25 August 2015. ^ a b Mikelbank, Peter (22 August 2015). "'Wrong Place, Right People': U.S. Servicemen, Passengers Speak Out after Foiling Possible Terror Attack on European Train". People. Retrieved 22 August 2015. ^ a b c d e "France train shooting: Attack 'was well prepared'". BBC News. 25 August 2015. Retrieved 25 August 2015. ^ a b "France train attack: What we know about suspect Ayoub El Khazzani?". CNN. 25 August 2015. Retrieved 22 September 2015. ^ "France train shooting suspect profile: Ayoub El-Khazzani". BBC. 25 August 2015. Retrieved 22 September 2015. ^ "Des militaires américains évitent un carnage dans un Thalys reliant Amsterdam à Paris [American soldiers avoid bloodshed in a Thalys train from Amsterdam to Paris]". Le Monde (in French). 21 August 2015. Retrieved 21 August 2015. ^ Landauro, Inti; Schechner, Sam (21 August 2015). "Three Wounded in Attack on French Train". The Wall Street Journal. Retrieved 21 August 2015. ^ "US student tells of his attack on French train gunman". The Guardian. 22 August 2015. Retrieved 17 September 2015. ^ a b c d "France train shooting: Three hurt and man arrested". BBC News. 22 August 2015. Retrieved 21 August 2015. ^ a b Soren Seelow (19 December 2016). "Attaque du Thalys : le terroriste était sous les ordres d'Abdelhamid Abaaoud". Le Monde (in French). Retrieved 2 March 2019. ^ Newmark, Zack (21 August 2015). "Three hurt in Amsterdam-to-Paris train "terrorist attack"". NL Times. Retrieved 21 August 2015. ^ a b Pennetier, Marine; MacDonald, Catherine (23 August 2015). "French train gunman 'dumbfounded' by terrorist tag". Reuters. Retrieved 23 August 2015. 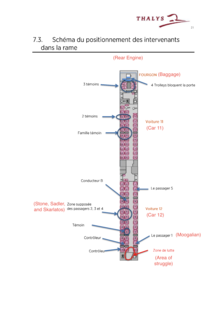 ^ "Internal report of Thalys" (PDF). Thalys (in French). 18 September 2015. Retrieved 18 September 2015. ^ a b c "2 members of U.S. military stop Islamist attacker on train in Belgium". CNN. 21 August 2015. Retrieved 22 August 2015. ^ a b "Tirs dans un Thalys : ce que l'on sait du suspect [What is known about the suspect in the foiled Thalys attack]". Le Monde (in French). 21 August 2015. Retrieved 22 August 2015. ^ a b c d e f g Barrett, David (23 August 2015). "Revealed: The mystery man who tackled AK-47 assault rifle from train gunman". The Daily Telegraph. Retrieved 23 August 2015. ^ a b c Suc, Matthieu (22 August 2015). "Attaque dans le Thalys : "J'ai levé la tête et j'ai vu un gars avec un AK-47 " [Attack on the Thalys: "I looked up and I saw a bloke with an AK-47"]". Le Monde (in French). Retrieved 22 August 2015. ^ a b c d "US student tells of his attack on French train gunman". The Guardian. 22 August 2015. Retrieved 22 August 2015. ^ a b Gray, Melissa; Meilhan, Pierre (22 August 2015). "Americans who thwarted train attack praised for 'exceptional courage'". CNN. Retrieved 22 August 2015. ^ "France awards 3 lifelong American friends, Briton for stopping train attack". CNN. 24 August 2015. Retrieved 24 August 2015. ^ Krisnadev, Calamur (24 August 2015). "How France Is Rewarding Three Americans Who Thwarted a Gunman on a Train". The Atlantic. Retrieved 24 August 2015. ^ a b Shapiro, Emily. "Inside the Attack on Paris-Bound Train: The Timeline of Terror". ABC News. Retrieved 29 January 2018. ^ a b c d Ganley, Elaine (23 August 2015). "US airman says train attacker 'ready to fight to the end'". Yahoo! News. Retrieved 23 August 2015. ^ a b c d "France: 3 Americans subdue gunman on high-speed train". Associated Press. 22 August 2015. Retrieved 22 August 2015. ^ "Train shooting victim played dead before gunman was overpowered". CBS News. 26 August 2015. Retrieved 26 August 2015. ^ a b "Lajes Field Airman, fellow travelers stop attack on French train". USAFE AFs Africa Public Affairs. 22 August 2015. Retrieved 23 August 2015. ^ a b "U.S. soldier wounded helping to overpower gunman on train in France". Reuters. 22 August 2015. Retrieved 22 August 2015. ^ a b "French train shooting: Brit helped restrain gunman as US soldier reveals how he thwarted attack". Daily Mirror. 22 August 2015. Retrieved 22 August 2015. ^ a b "Attaque du Thalys : sans eux " nous serions tous morts "" [Thalys Attack: Without them, "we would all be dead."]. Le Monde (in French). Retrieved 23 August 2015. ^ a b c "Relatives proud of 3 Americans who subdued gunman on train". Associated Press. 22 August 2015. Retrieved 25 September 2015. ^ a b "France high-speed train shooting: Aftermath of attack". The Daily Telegraph. 22 August 2015. Retrieved 22 August 2015. ^ a b c d "'I realised the only way to survive was to go for him' – British hero describes moment he and three Americans beat up train terrorist". The Daily Telegraph. 22 August 2015. Retrieved 22 August 2015. ^ "Deux blessés par balle dans un Thalys reliant Amsterdam à Paris" [Two wounded in a Thalys going from Amsterdam to Paris] (in French). Le Monde/AFP. Retrieved 22 August 2015. ^ "French official: 2 Americans subdued train gunman". The Washington Post. Retrieved 21 August 2015. ^ Bitterman, Jim. "France train attack: What we know about suspect Ayoub El Khazzani?". Cnn.com. CNN. Retrieved 29 January 2018. ^ a b c d Nossiter, Adam. "A Shot, a Glimpse of an AK-47, and U.S. Servicemen Pounced on Gunman on Train to France". The New York Times. Retrieved 25 August 2018. ^ a b c d e f "Europe – Briton who helped stop French train attack says 'no hero'". France 24. 7 August 2015. Retrieved 22 August 2015. ^ Nossiter, Adam. "A Shot, a Glimpse of an AK-47, and U.S. Servicemen Pounced on Gunman on Train to France". The New York Times. Retrieved 29 January 2018. ^ Tenia, Mark (24 August 2015). "Midlothian man's family speaks out following attack on French train". wric.com. Retrieved 31 August 2015. ^ Callus, Andrew (23 August 2015). "U.S. airman in French train shooting plugged passenger wound with fingers". Reuters. Retrieved 23 August 2015. ^ Adam Nossiter (22 August 2015). "A Shot, a Glimpse of an AK-47, and U.S. Servicemen Pounced on Gunman on Train". The New York Times. Retrieved 22 August 2015. ^ "France train shooting: What we know". BBC News. 24 August 2015. Retrieved 24 August 2015. ^ "A quoi sert la fiche S?". i-Télé. 23 August 2015. Retrieved 22 September 2015. ^ Chrisafis, Angelique (22 August 2015). "France train attack: Americans overpower gunman on Paris express". The Guardian. ^ "Thalys : El-Khazzani mis en examen et écroué pour une attaque " ciblée et préméditée"" [Thalys: El-Khazzani investigated and jailed for an "targeted and premeditated" attack]. Le Monde (in French). 25 August 2015. Retrieved 25 August 2015. ^ a b "France train shooting: Gunman known to police". BBC News. 22 August 2015. Retrieved 22 August 2015. ^ Badcock, James; Barrett, David (23 August 2015). "Terrorist's father speaks for the first time". The Telegraph. Retrieved 23 August 2015. ^ a b Tomlinson, Simon; Wyke, Tom (25 August 2015). "Blindfolded and barefoot, the French train terrorist who 'watched a jihadi video' minutes before attack was foiled by hero passengers". Daily Mail. Retrieved 25 August 2015. ^ a b Barriaux, Marianne; Froissart, Pauline (23 August 2015). "French investigators quiz 'dumbfounded' gunman". Yahoo! News. Retrieved 23 August 2015. ^ "El autor del atentado contra el tren Ámsterdam-París vivió en Algeciras [The author of the attack on the Amsterdam-Paris train lived in Algeciras]". El País (in Spanish). 22 August 2015. Retrieved 22 August 2015. ^ a b c d "France train gunman identified as Islamist militant". Reuters. 22 August 2015. Retrieved 22 August 2015. ^ "Suspected Amsterdam-Paris train attacker spent seven years in Spain". El Pais. 22 August 2015. Retrieved 11 September 2015. ^ "France train gunman 'dumbfounded' by terrorism allegations, lawyer says". ABC News. 23 August 2015. Retrieved 23 August 2015. ^ "US airman credits gut instinct for subduing train gunman". The Belfast Telegraph. 23 August 2015. Retrieved 23 August 2015. ^ "France train suspect watched jihadi video, prosecutor says". Yahoo! News. 25 August 2015. Retrieved 26 August 2015. ^ Izadi, Elahe (25 August 2015). "Suspect in high-speed train attack had 'terrorist intent,' French officials say". The Washington Post. Retrieved 25 August 2015. ^ "Paris attack guns 'bought by Amedy Coulibaly in Belgium'". The Daily Telegraph. 14 January 2015. Retrieved 22 August 2015. ^ "Belgian market deals in death". The New Zealand Herald. 24 August 2015. Retrieved 25 August 2015. ^ "French train attack: Belgian station is close to notorious weapons supply line". The Daily Telegraph. 23 August 2015. Retrieved 25 August 2015. ^ Randolph, Eric (25 August 2015). "Moroccan charged with terror attack on French train". Yahoo! News. Retrieved 25 August 2015. ^ "Attaque du Thalys: un an après, le mystère El Khazzani reste entier" (in French). BFM TV. 21 August 2016. ^ Wagner, Meg; Greene, Leonard (26 August 2015). "3 Americans and Brit honored in France as 5th train hero is identified as French-American professor". The New York Daily News. Retrieved 26 August 2015. ^ Ellis, Ralph; Karimi, Faith; Fantz, Ashley; Robertson, Nic (25 August 2015). "Train heroes 'gave us an example of what is possible,' says French President". CNN. Retrieved 25 August 2015. ^ "French train attack heroes to be awarded Légion d'honneur". The Guardian. 24 August 2015. Retrieved 9 September 2015. ^ Dwilson, Stephanie Dube (22 August 2015). "Chris Norman, Belgium Train Hero: 5 Fast Facts You Need to Know". Heavy. Retrieved 3 September 2015. ^ a b c Sangree, Hudson (23 August 2015). "Carmichael childhood, faith unite friends who stopped train attack". The Sacramento Bee. Retrieved 24 August 2015. ^ a b Miner, Colin (27 August 2015). "Alek Skarlatos: 'Good to be home with family'". KOIN. Retrieved 7 September 2015. ^ "Airman wounded in train attack being treated at US military hospital in Germany, doing well". Associated Press. 25 August 2015. Archived from the original on 28 August 2015. Retrieved 31 August 2015. ^ "Hero American: Train attacker was ready to fight, but "so were we"". CBS News. 23 August 2015. Retrieved 31 August 2015. ^ Har, Janie (2 September 2015). "California Man Recounts Tackling Gunman on Paris-Bound Train". ABC News. Retrieved 3 September 2015. ^ a b Chrisafis, Angelique; Kassam, Ashifa (24 August 2015). "French train attack men given Légion d'honneur for 'preventing massacre'". The Guardian. Retrieved 17 September 2015. ^ "Americans thwart train attack in France". CBS News. Retrieved 17 September 2015. ^ "Mark Moogalian receives France's highest honour". Public Radio of Armenia. 14 September 2015. Retrieved 17 September 2015. ^ a b "Le courage des héros américains et britanniques du Thalys salué après l'attaque [The courage of the American and British heroes in Thalys commended after the attack]". FranceTV (in French). 22 August 2015. Retrieved 22 August 2015. ^ "Sac State salutes senior who helped foil terror attack". Sacramento State News. 22 August 2015. Retrieved 17 September 2015. ^ "Paris train heroes to receive medals at Pentagon". Stars and Stripes. 14 September 2015. Retrieved 17 September 2015. ^ "Spencer Stone, French train hero, promoted to staff sergeant". Airforce Times. 1 November 2015. Retrieved 8 February 2016. ^ "Spencer and Sadler receive medal from Belgium". The Daily Dot. 8 October 2015. Retrieved 8 February 2016. ^ "Obama praises U.S. service members' action on French train". Reuters. 21 August 2015. Retrieved 7 September 2015. ^ Karimi, Faith (23 August 2015). "Train heroes: The men who helped avert a massacre in Europe". CNN. Retrieved 23 August 2015. ^ "Breedlove: U.S. Troops 'Heroes' in Train Attack". U.S. Department of Defense. 23 August 2015. Retrieved 23 August 2015. ^ "Voilà comment Koen Geens entend lutter contre le trafic d'armes [How Koen Geens intends to fight arms trafficking]". 7s7 (in French). 24 August 2015. Retrieved 24 August 2015. ^ "Attentat déjoué dans un Thalys : le ministre de la Justice avance 4 points d'action pour lutter contre le trafic d'armes [Attack foiled in a Thalys: the Minister of Justice puts forward 4 points of action to fight against arms trafficking]" (in French). lavenir.net. 24 August 2015. Retrieved 25 August 2015. ^ "France train attack: Europe 'to tighten rail security'". BBC News. 29 August 2015. Retrieved 31 August 2015. ^ "Belgium steps up security measures after train attack". News24. 22 August 2015. Retrieved 22 August 2015. ^ "Belgium calls on neighbors for more security on cross-border trains". Yahoo! News. 22 August 2015. Retrieved 22 August 2015. ^ Firn, David, Buck, Tobias (23 August 2015). "Terror attack on train puts spotlight on Schengen". Financial Times. Retrieved 24 August 2015. ^ Hughes, Chris (25 August 2015). "French train shooting: Gunman in bare feet with bandaged eyes in court appearance". Daily Mirror. Retrieved 25 August 2015. ^ a b "Attaque dans un Thalys: le parquet fédéral ouvre une enquête" [Attack On Board the Thalys: Federal Prosecutor's Office Launches Investigation]. Le Soir.be (in French). Le Soir. 22 August 2015. Archived from the original on 3 September 2015. Retrieved 3 September 2015. ^ a b "Spanish police search family house of Moroccan detained in France for high-speed train attack". Fox News Channel. 1 September 2015. Retrieved 5 September 2015. ^ a b c Ogier, Agnes; Pepy, Guillaume (23 August 2015). "Déclaration conjointe J-Hugues Anglade et sa compagne" [Joint Declaration of J-Huges Anglade and Companion] (PDF). Thalys.com (in French). Thalys Press Service. Archived from the original (PDF) on 27 September 2016. Retrieved 6 September 2015. ^ M. M.; C. Bq; Belga; Agence France-Presse (23 August 2015). "Attaque dans un Thalys: le suspect prétend qu'il voulait braquer le train" [Attack on the Thalys Train: Suspect Claims He Only Wanted to Rob the Train]. Le Soir.be (in French). Le Soir. Archived from the original on 6 September 2015. Retrieved 6 September 2015. ^ Newmark, Zack (21 August 2015). "Three hurt in Amsterdam-to-Paris train "terrorist attack"". NlTimes.nl. Archived from the original on 22 August 2015. Retrieved 6 September 2015. ^ "Qui est Abdelhamid Abaaoud, le commanditaire présumé des attentats ciblé par le RAID à Saint-Denis ?". Le Monde.fr. 16 November 2015. Retrieved 19 November 2015. ^ no by-line. "Paris attacks: 'Ringleader' Abdelhamid Abaaoud killed in raid". BBC News. Retrieved 19 November 2015. ^ Pieters, Janene. "New arrest in foiled Amsterdam-Paris train attack". NL Times. Retrieved 15 February 2018. ^ "Internal report of Thalys" (PDF). Thalys (in Dutch). 18 September 2015. Retrieved 18 September 2015. ^ Blachere, Emilie (22 August 2015). "Anglade: 'Rendre hommage à leur courage héroïque' [Anglade: Honor their heroic courage]". Paris Match (in French). Retrieved 22 August 2015. ^ a b "Thalys : Jean-Hugues Anglade nuance ses propos" [Thalys: Jean-Hugues Anglade clarifies his words]. Le Figaro (in French). 24 August 2015. Retrieved 12 February 2016. ^ Jamet, Constance (22 August 2015). "Jean-Hugues Anglade s'insurge contre le personnel du TGV, Thalys répond [Jean-Hugues Anglade rebels against the staff of the TGV, Thalys answers]". Le Figaro (in French). Retrieved 23 August 2015. ^ "Thalys: polémique autour de la diffusion d'images d'Ayoub El-Khazzani menotté" [Thalys: Controversy over Publication of Images of Ayoub El-Khazzani in Handcuffs]. Le Monde. 26 August 2015. Retrieved 16 September 2015. ^ "Thalys: yeux bandés, pieds nus... l'arrivée du suspect à Paris est-elle légale?" [Thalys: blindfolded, barefoot... Was the Arrival of the Suspect in Paris Legal?]. Metronews. 25 August 2015. Retrieved 16 September 2015. ^ "Thalys: l'avocat d'El Khazzani dénonce "un traitement inhumain"" [Thalys: Attorney for Khazzani denounces 'Inhumane Treatment']. Le Point. 26 August 2015. Retrieved 16 September 2015. ^ "Le parquet de Paris met en garde i-Télé pour avoir montré Ayoub El-Khazzani menotté" [Paris Prosecutor's Office Issues Warning to i-Télé for Showing El-Khazzani in Handcuffs]. Le Monde. 1 September 2015. Retrieved 16 September 2015. ^ Kroll, Justin (11 July 2017). "Clint Eastwood Casts Real-Life Heroes in Next Film 'The 15:17 to Paris' (EXCLUSIVE)". Variety. Retrieved 11 July 2017.